Waves slam the Oceana Pier & Pier House Restaurant in Atlantic Beach, North Carolina, Thursday, Sept. 13, 2018 as Hurricane Florence approaches the area. Coastal streets flowed with frothy ocean water and tens of thousands lost electricity. Forecasters said “catastrophic” freshwater flooding was expected along waterways far from the coast of the Carolinas. The storm’s intensity held at about 90 mph, and it appeared that the north side of the eye was the most dangerous place to be as Florence moved ashore. 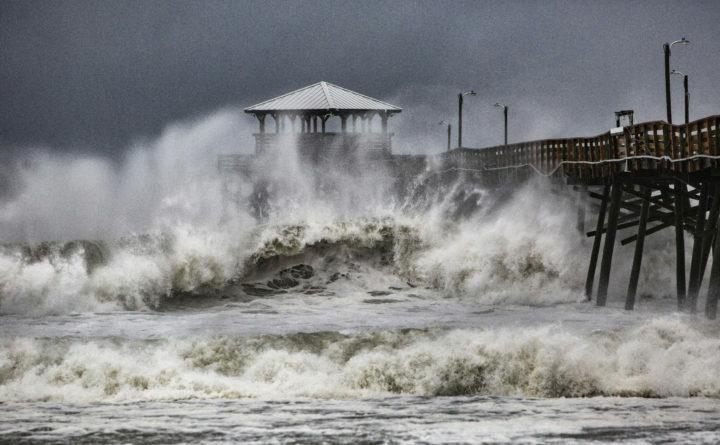 A weather station at a community college recorded a 100 mph wind gust, and forecasters tweeted that a 91 mph wind gust slammed into Wilmington’s airport, surpassing the power of Hurricane Fran two decades ago.